I’m sharing something really fun today. 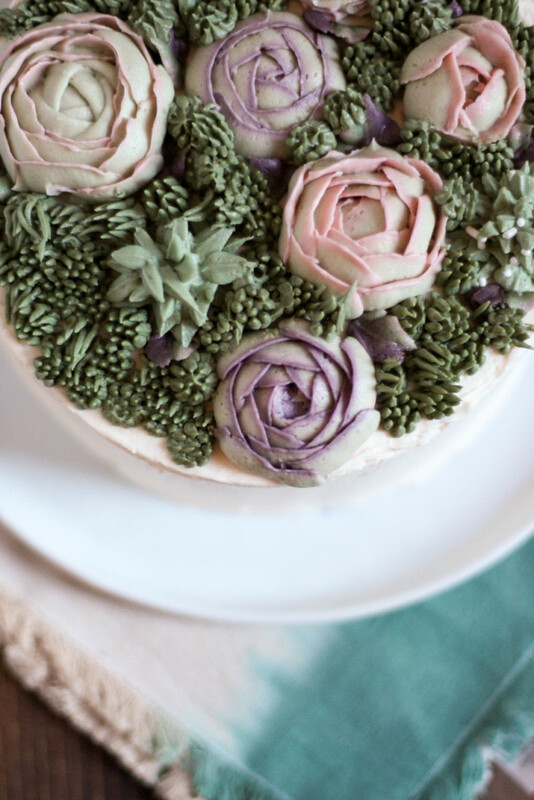 A few weeks ago, I decided I would attempt to make a succulent decorated cake as a thank you to a friend who happens to love succulents. He and his wife bought me an adorable wood cupcake stand at Magnolia Market when they were visiting! (EEK, I dream about going there). Sidenote- this friend, Chaz, always calls succulents “succies,” which we all thought was something he had made up, but it turns out that’s a real thing (what??). Seriously, search for it on Instagram and get amazed. So, today I’m not actually including a recipe, I’m just sharing some pictures and the links to the tutorials that I used, as well as the list of tips that I used. The tutorials that I used were honestly way better than anything I could put together on my own to post here since this was the first time I’ve worked with literally any of these tips, or a flower nail even. Use a flower nail. Seriously, I considered trying to pipe the plants directly on the cake, and now that I’ve used the flower nail it seems like it would be IMPOSSIBLE without it. Do it on a day when your house isn’t too hot. Mine was pretty darn toasty as we hadn’t gotten our swamp cooler up and running for the season yet, and I really think it would have been easier if my frosting didn’t keep melting. 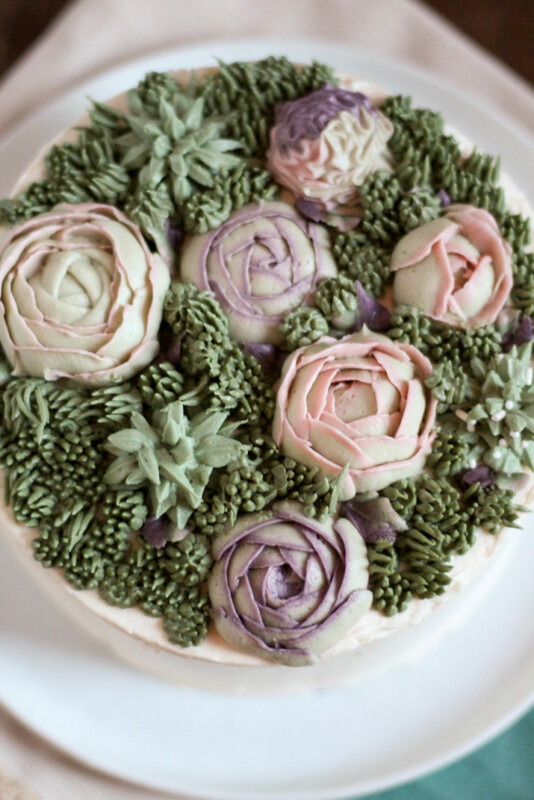 Freeze your flowers before placing them on the cake. Again, I’m just not sure how people do this otherwise, but it was a huge help to me when it came to taking them off the parchment and placing them on the cake. 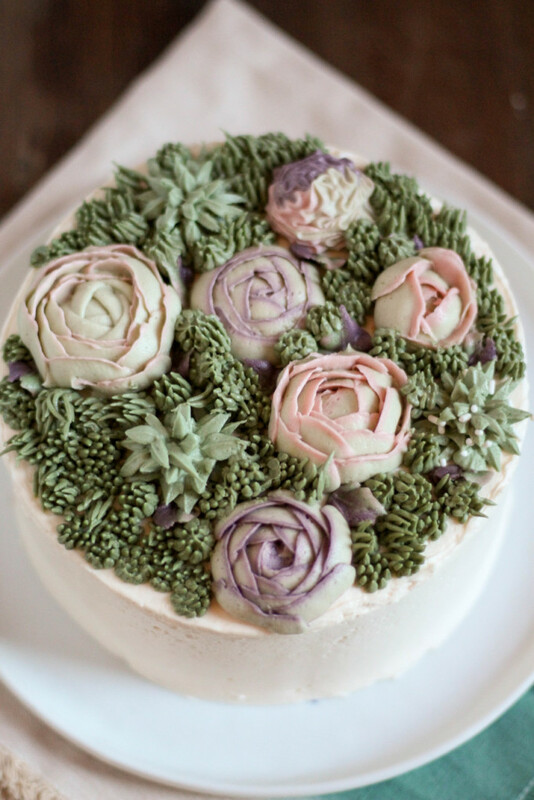 Tutorial one- From Wilton: There’s a video on the sidebar that was super helpful to me in figuring out how to stripe the frosting, and how to generally hold and use all the tips for each type of flower/plant. Tutorial two- From Craftsy: Another SUPER helpful page- this one has fantastic step-by-step photos on how each part of your piping adventure should look! Wilton 233: For the grassy-looking stuff that is filling in most of the cake. Wilton 352: For the spiky-looking green plants. Ateco 61: For the roses. Wilton 21: For the multi-colored wavy blob thing in the back. (clearly this wasn’t my fav plant on the cake ha). I hope you guys try this out! It’s probably the coolest thing I’ve ever done as a baker, and now I’m pretty pumped to find other occasions to do it again! Your cake is unbelievable. 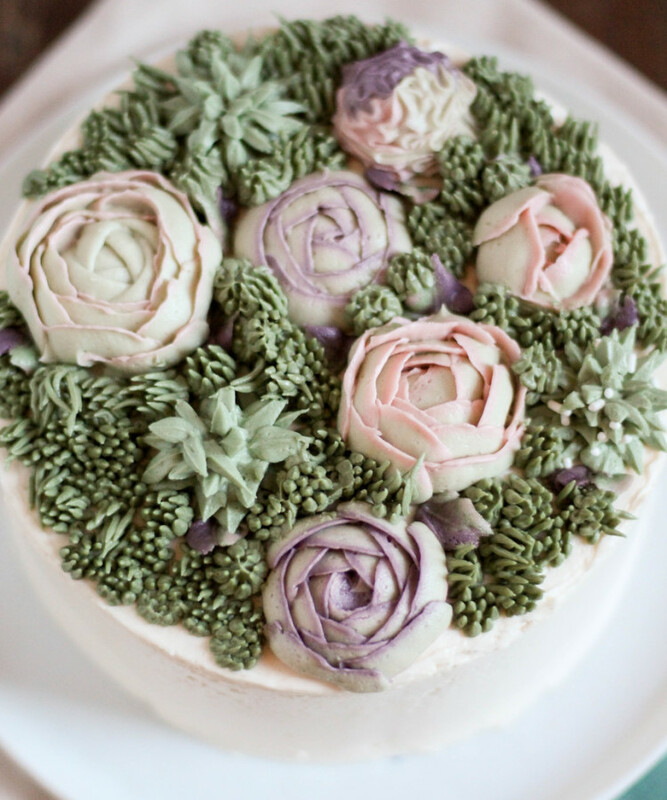 I saw these cakes and cupcakes on BuzzFeed and wanted to know if you know the name and website of the company that makes them. Could you please let me know?